The last Shishu Prohor (special schedule for the children) will be celebrated on Saturday as part of Amar Ekushey Book Fair. 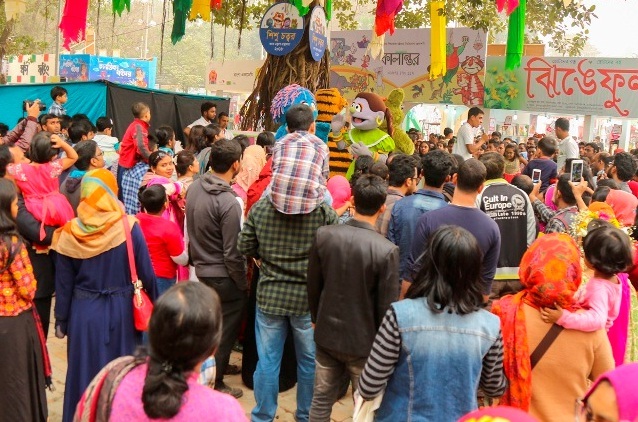 Bangla Academy authorities announced the special schedule for the children during every Friday and Saturday to focus on the children’s participation in the fair, reports UNB. The authorities said that the children’s corner takes a different look with colourful things to allure the children in the fair so that children can get the inspiration to visit the fair again. On Friday, a good number of children celebrated the Shishu Prohor with their parents. The long queues were seen at every entry point of both sides from the morning as it was the holiday. The last Shishu Prohor will be celebrated from 11am and 1pm while the book fair will remain open from 11am to 9pm. The prize giving ceremony of the children’s painting, music, general knowledge and public speaking competition will be held on the day at 10.30am. Visiting the fair, UNB found most of the children were choosing their favourite books attentively and happily. The Unmad editor, cartoonist Ahsan Habib said that children can learn everything from here. They will be interested not only in books but also gain knowledge from friendship and sympathy. Friends of Sisimpur were the centre of interest in the morning. To see Hulum, Ikri, Tuktuki, Shiku, they gathered at the Sisimpur stage of the children's premises. A total of 100 children books and 82 rhymes hit the fair until the 22nd day. Publishers shared that more books were being sold this year than the previous year. The sales have been increased during the special time. Children are interested in the aesthetically rich, illustrated, coloured books, they said.